**Disclosure: This is a post written by me about a recent sponsored opportunity I had with Verizon. All thoughts and opinions, as always, are my own. Something pretty fricking awesome happened recently. 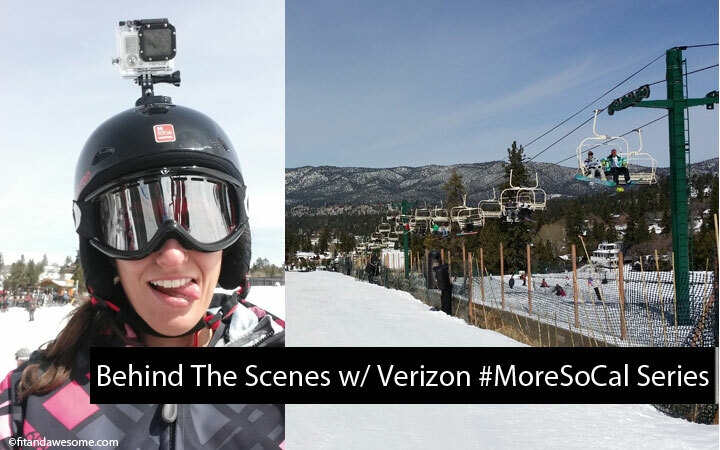 I was chosen by Verizon to be the star of their #MoreSoCal web video series. Southern California is a pretty special place and one of the coolest things about SoCal is you’ve got the beach and the mountains both in close proximity. The distance is close enough to where you can actually surf and snowboard in the same day! The first part of the Verizon #MoreSoCal series is all about surfing and snowboarding in the same day. Talk about a dream opportunity! We started out the day at 5am. Yes, 5am! I looked out my window and saw a film crew outside waiting to capture footage. When I got out to my car, I did a meet and greet with the team and then they mic’ed me up and I did a little intro piece before we took off to drive up to Big Bear. Who am I? It was so surreal! I had a great time on set with the Verizon staff. Truthfully it was kind of bizarre for me because in my day job as a Digital Marketing Consultant I’m used to being the one working with talent. This time I was the talent! I wasn’t sure what it was going to be like being on the camera, but it came fairly naturally to me. Hmm, maybe I should start doing more videos for Fit & Awesome. If so then I would definitely need to work on my video editing skills! Another cool perk about this web series is I got to use all sorts of awesome devices. My favorite was the GoPro Hero3 which was strapped to my helmet, my snowboard, and on my surfboard. I have one of the original GoPro HD cameras (believe it or not) and this camera made me realize I am in need of a serious technology serious upgrade. We synced up the Go Pro to my snowboard and we connected wirelessly to the GoPro app and were able to view what the camera saw. This was really helpful because we weren’t entirely sure what angle was going to look best with the GoPro mounted on my snowboard. Being able to view live footage on the Go Pro app made it easy. Love it! The film crew was truly awesome and I had a great time being a part of the #MoreSoCal web series. Look for Part 2 and Part 3 coming soon! What about you? Have you ever surfed and snowboarded in the same day? What is your ultimate SoCal day? Post in the comments and let me know. Looking good Lindsay! Only in SoCal. Thanks, Melissa! It really is a special place. I know, right?? So stoked on how it turned out! We need to shred together. Ever go to Jackson, WY? I’ve never been but it’s on my to-do list! We are season pass holders to Mammoth! Where do you like to go? I’ve been thinking about a GoPro for some in car filming, I personally think I’m hilarious while stuck in traffic. Stoked you worked with Verizon, I’ve always thought they are “the network of/for professionals” who are always on the go, and gearing to get shiz done! You should totally tape a GOPRO to your dashboard. That would be hilarious. Looked like an awesome day Lindsay! Thanks for sharing!! This is so awesome Lindsay — congrats! So friggin’ cool! You go girl!